OMG Posters! » Archive New Art Print and Mystery Tube from Justin Santora - OMG Posters! Justin Santora is becoming another one of those insanely prolific Chicago artists. First, he has a new art print out. 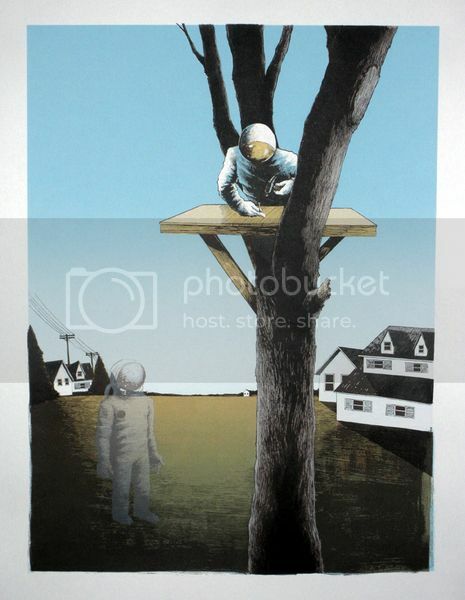 “The Whole Story” is an 18″ x 24″ screenprint, has an edition of 30, and is $30 shipped. Secondly, he is offering up mystery tubes for $55. You’ll receive at least five prints, including concert posters, art prints, unreleased variants, etc. Each tube also includes an original drawing or sketch. Awesome. Visit the Gigposters.com Classifieds.